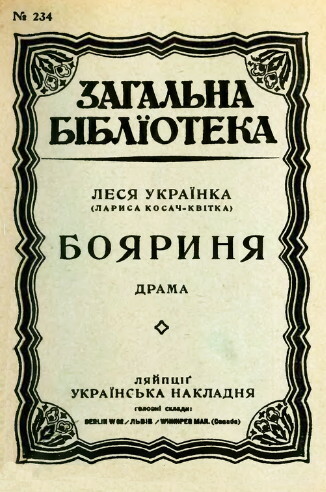 Ukrainska Nakladnia (Українська Накладня; Ukrainian Publishing House). A publishing house owned by Yakiv Orenshtain. From 1903 to 1918 it operated in Kolomyia as Halytska Nakladnia (Galician Publishing House). From 1919 to 1932 it was located in Berlin. It issued hundreds of popular books: works on Ukrainian history and culture, illustrated editions of Ukrainian classics and contemporary Ukrainian literature, translations (eg, of Molière, Rudyard Kipling, Friedrich Nietzsche, Anatole France, Leo Tolstoy), textbooks, atlases, musical scores, songbooks, and children's literature. Its Zahalna biblioteka (General Library) book series had 238 titles, of which 113 were published in Kolomyia and 125 in Berlin.